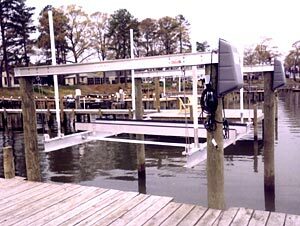 Oldest most proven design, high profile design allows you to raise your boat further out of the water in rough sea conditions. Overhead beams tie into piling for better support. Powered by 2- worm gear driven winches. 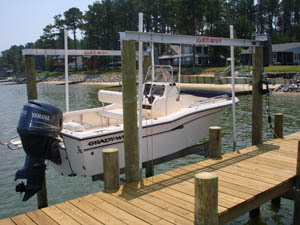 Using an aluminum overhead boat lift is a great way to protect your boat from wind, water, and weather damages. 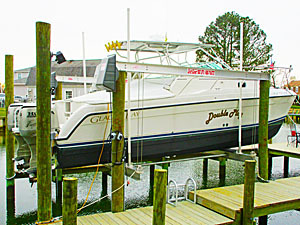 It will also increase the longevity of your boat’s life. Consider this an investment. 5,000 lbs. to 12,000 lbs. Please check with East Coast Boat Lifts to confirm piling configurations as improvements and product modifications	may cause piling specification to change.